NASA’s Curiosity rover had been studying Mars for years before a scientist thought of using it for something new: making the first surface gravity measurements on a planet other than Earth. Scientists can learn a lot about a planet by measuring what lies beneath the surface at a particular location. Higher density rocks in the subsurface, for instance, exert a slightly greater downward gravitational force than lower density rocks. So variations in gravity reveal the density of underlying rock, providing clues to the area’s geologic history. Typically, to measure gravity on Mars and other planets, researchers rely on orbiting satellites like the Mars Reconnaissance Orbiter. But because the satellites are so far away from their targets, the spatial resolution is limited. For example, one can barely make out Gale Crater—with its 150-kilometer (just over 93 miles) span—in the satellite gravity data of Mars. This limitation frustrated Lewis. 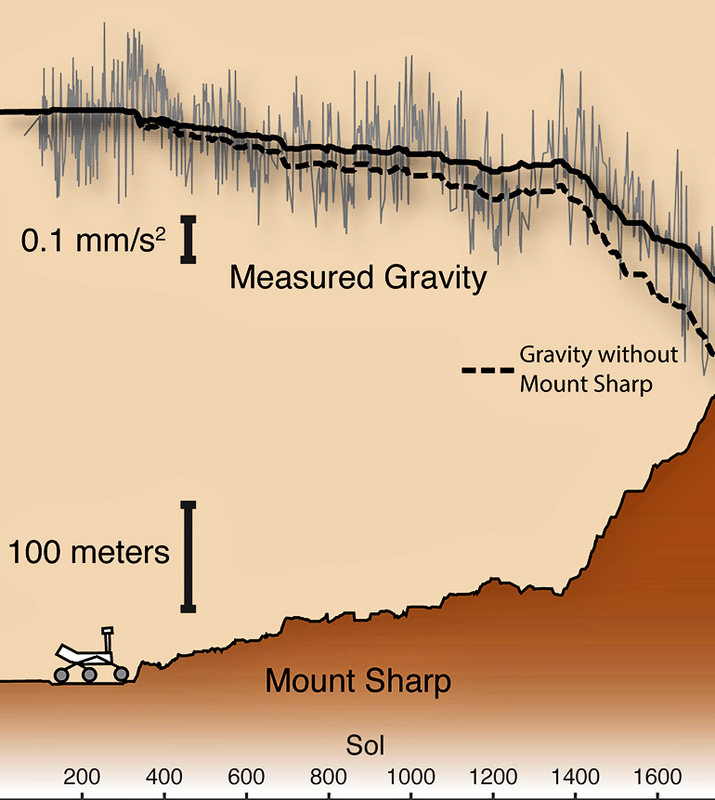 He thought of using existing data from accelerometers in the rover’s navigation equipment to measure surface gravity as the rover climbed Mount Sharp, a 5-kilometer (just over 3 miles) mountain within Gale Crater and the focus of Curiosity’s exploration. Lewis and his team took into account Mars’ rotation to accommodate expected changes in acceleration. Next, they calibrated this raw information, accounting for the effects of temperature, the tilt of the rover, and other factors. They were surprised to find that Curiosity was moving over low-density areas of rock. The CheMin instrument on the rover had previously told them the minerals comprising the sedimentary rock were not low density, meaning the rock must be highly porous, with lots of small gaps and spaces. When geologic processes first deposit sediments, they typically contain lots of empty space. As they are buried over time, sediments become more compacted, increasing their density. Scientists have previously suggested that Gale Crater may have been completely filled in with sedimentary rock and that, over time, Mount Sharp was carved out of these layered sediments by erosion. The low subsurface density Lewis’ team found along Curiosity’s traverse at the base of Mount Sharp implies, however, that it was never buried very far. This suggests that the mountain may have formed from wind-driven material piling up at the bottom of the crater rather than by erosion. Lewis says there might be even more unexpected findings coming from Curiosity and its “newest” instrument. Additional coauthors are from NASA’s Jet Propulsion Laboratory, the Carnegie Institution of Science, Arizona State University, and the University of Maryland. NASA funded the work.